GI Joe/Action Team Grosswild Safari European 70s issue of White Tiger Hunt, no tent, gun present, but broken (not in pic). VHTF. Action Man GI JoeAction Team Special Operations Kit, German issue, with some htf pieces. 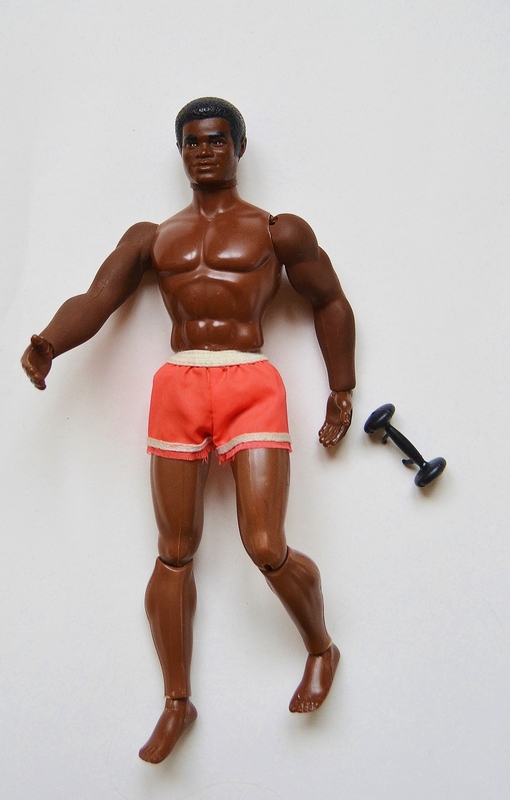 Big Jim Big Jack with shorts and dumbbell, chopping arm works, doll flawless, shorts unraveling a little bit. Big Jim doll Gold Medal with accessories. Big Jim Standard in yellow orange swimsuit. Big Jim Jeff doll, with part of diving gear. Big Jim doll Jeff, excellent, with original short pants. Big Jim Sports/Runner doll 1984, European issue, small rubs back of hair, not disturbing. Big Jim Karl May doll Bloody Fox and horse blanket. Big Jim doll Karl May Old Shatterhand with Scout outfit. Big Jim Eagle and arm sleeve protector, with original booklet, htf. Big Jim horse Fury (Furia) with original gear. Big Jim Karl May hat Old Shatterhand hat. Big Jim outfit 1975 Safari aka Scout, excellent. Big Jim outfit Boxer, shorts bit unraveling, otherwise fine. Big Jim outfit Dakota Joe Old Shatterhand. Big Jim Dr Steel pants. Big Jim Karl May Cavalry outfit,as new condition. Big Jim outfit Karl May Cavalry, yellow scarf. Big Jim Kung Fu, new condition, with accessories. Big Jim Motorcycle outfit, with helmet and boots, excellent. Big Jim parts from Miner and Construction sets, excellent, htf. Big Jim outfit Pilot, with goggles and boots. Big Jim three sportive outfits Sailing, Tennis and Kung Fu, all excellent. Big Jim Winnetou and Old Shatterhand outfit Chief. Big Jim Winnetou and Old Shatterhand outfit Chief, headdress. Big Jim blue ski boots for #9430 or #9492 ski outfits. Big Jim kung fu/karate break board. Big Jim accessories from Wigwam playset. Bionic Man Adventure - Test Flight At 75000 Feet jumpsuit, perfect. Bionic Man doll in original suit and shoes, excellent doll and outfit. Bionic Man doll Mr Goldman, trouwers tlc, need washed and repaired on the seam, otherwise excellent doll and outfit, complete, with htf shoes. Bionic woman doll with mission purse and most accessories, very minor playwear, excellent doll and outfit. Bionic Woman mission purse, with some accessoires. Bionic Man Mission to Mars glove. Bionic Woman outfit Classy Culottes. Bionic Woman outfit Floral Delight, with scarf and shoes, perfect. Bionic Woman outfit Gold Dust, with rare shoes, minor playwear (from playlot, not mint), but in a nice condition. Bionic Woman Peach Dream, excellent, closure and pearl decorations intact, with htf shoes. Bionic Woman outfit Silk n Satin, some playwear on belt, with vhtf shoes. Bionic Woman outfit Country Comfort, variation, with shoes. Bionic Woman shoes lot Gold Dust (SOLD)-Red Dazzle-Butterfly-Peach Dreams (2x)-Floral Delight - Casual Day (2x)-Blue Mist/Lime Lite. GI Joe cadet West Point Air Force Shoes. GI Joe French Legionnaire coat. GI Joe Legionnaire hat, not sure for which type doll this was made.